I have recently discovered my supplier of 24kt gold electroplated leaves will no longer be creating these beauties. I can't even get anymore at this point. But, luckily I do still have a few in stock. 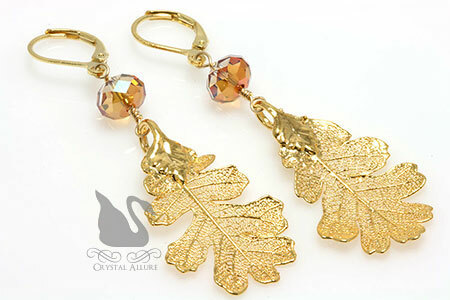 Already designed are the Real Lacey Oak Leaf Crystal Earrings (E135), shown below. Stunning in gold, perfect for fall! What makes these leaf earrings so unique is the process used to electroform a real leaf. You can read more about this delicate process under my Jewelry Articles. And now, your leaf jewelry purchases at Crystal Allure just got even more unique because the leaves will no longer be made! It must be the season but in autumn I always get excited about creating leaf jewelry. It's as close to nature as I can get without slapping on a pair of earwires to a crumbling real leaf! 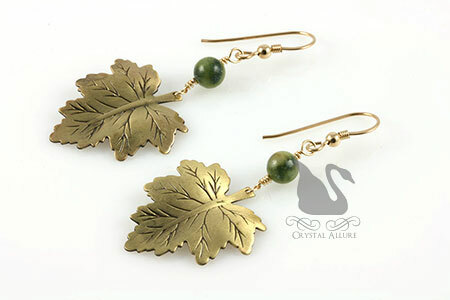 So, to compensate but allow me to showcase the beauty of nature, I found these brass maple leaves and combined them with nephrite jade for the perfect leaf earrings! Although most of the leaves have fallen, there is one that has not quite turned the beautiful shades of autumn and that would be The Last Leaf. 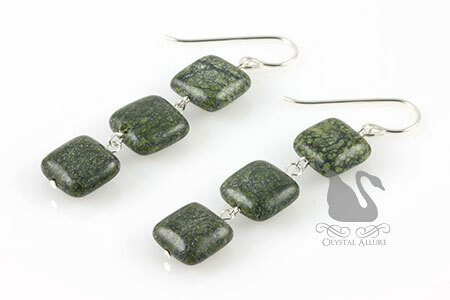 These beautiful handmade bead earrings were created with a gentle shade of green nephrite jade gemstone highlighted by a burnished antiqued golden brass metal maple leaf. Finished with 14kt gold-fill earwires. Length is 1-1/2" from the bottom of the earwire. 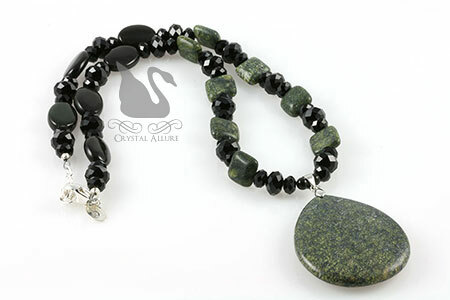 Get your one-of-a-kind beaded leaf jewelry at Crystal Allure. New to the online store is our Cranberry Rose Freshwater Pearl Beaded Necklace (N064). So simple, yet so stunning. Appropriately named "Cranberries and Roses", which feature a rich cranberry colored freshwater pearl, it is the perfect color to add to your fall wardrobe. 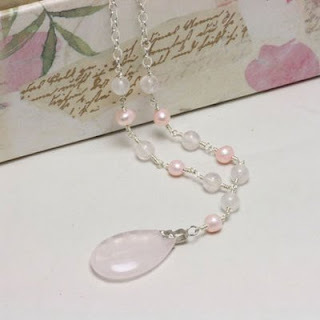 A simply stated handmade beaded necklace of high quality rich cranberry colored freshwater pearls highlighted by a sterling silver carved rose charm pendant. Sterling silver. Measures 17-3/4". Don't miss out, this is a one-of-a-kind, handmade beaded necklace and it was featured in the following media: -Indie Collective Shopping Guide Spring/Summer '09. In other news: The month of October generally starts show season and I've been busy creating and preparing for upcoming shows. This month alone there are three shows in a row, one each week! Directly after a show, I do my best to replenish stock for the next show. Sometimes, pieces do not even make it to the online store before they are gone for good. The past two shows have been for Ortho Clinical Diagnostics' (Johnson & Johnson) annual United Way campaign. I just love doing these shows as I get to meet some pretty fantastic ladies and my set up is usually near a window (daylight...something I don't get with my day job!). Also, at my day job, there are not many women around so I jump at the chance to socialize with the gals. The first show held directly at Ortho Clinical, I was super busy -and loved it! It is extremely satisfying to be able to showcase your jewelry to an exclusive group and the environment allows me time to talk about what inspired a particular design and the materials used. I have found it is so very important that my customers know they are receiving quality jewelry handcrafted by me (alone). I'm getting so tired of mass produced stuff in America and I have found myself purchasing quite a few handmade items -whether for myself or a gift. Granted there are some things that cannot be purchased handmade in America, but if I can contribute to keeping our economy healthy with my made in America designs -then so it shall be! At the Ortho Clinical show, I also received numerous custom orders and so I've been busy with those as well. It's been uplifting to hear my customers comments when they receive their custom jewelry piece -it makes it all worth it. Hmm..I think too that I had a larger table set up this year? If not, it worked perfectly and allowed me to put out pretty much my entire stock of jewelry, to give shoppers the most to choose from. The second show for Ortho Clinical was at a new location. They have purchased/rented some space at the Kodak building and I had the oppportunity to set up my wares in a conference room. It was huge! And all mine! In fact, I was worried that it might be more space than I had product to display, but it turned out perfectly. The show here was a little slower and not as successful as the first one. But it allowed me to test more set up options; gave me some quiet time (without my computer in front of me!) to sketch out some new designs and it also provided me with some observations. It didn't hurt either that I got some feedback from my contact. All in all, the first two shows were a success in every way and I look forward to next year. Armed with more knowledge of my customers needs I'm fairly confident next year will be as successful as this year -and even better! I'd like to thank both Holly and Liliana for coordinating the event and inviting me, Crystal Allure Designs, to showcase my jewelry designs. I am happily married but I will admit, every chance I get, I watch Platnium Weddings on the WE channel. I can't help but drool over all the sparkle in these weddings and it never ceases to amaze me the new ideas these brides come up with! 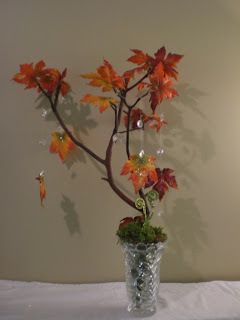 One day, I'm searching around Etsy and I happened to stumble upon these stunning Swarovski Crystal Wedding Trees. Immediately I wanted one just because they were so beautiful! Then I thought about how elegant they would have looked at my wedding reception! Then I just wanted to share my find with all my readers. You simply have to check out RaewynKelly's Etsy store! 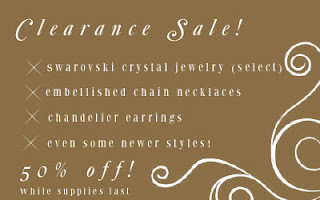 If you're a Bride-To-Be, get custom bridal jewelry created -just for you -at Crystal Allure Creations. 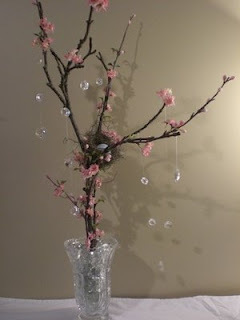 Add these Crystal Trees to your wedding and viola' -your very own Platnium Wedding!